Now Foods Bromelain is a dietary supplement in the composition of which there is bromelain – a natural extract from pineapple. Very high enzymatic activity (as much as 2400 GDU!) guarantees effectiveness and proper strength of effects. The preparation is recommended mainly in order to improve the functions of the digestive system, however, the spectrum of its pro-health properties is much wider. It allows to take advantage of the supplement also to support immunity, accelerate regeneration after injuries and prevent circulatory system diseases. Bromelain is a natural enzyme extracted from fruits or stems of pineapples, classified to the group of proteinases. Their main task is the hydrolysis of peptide bonds, therefore we say about bromelain that it is an enzyme which digests protein. The basic element of bromelain is proteolytic-sulfhydryl fraction. Other active compounds are phosphatases, glucosidases, celluloses and glycoproteins. The synergistic effect of all substances contained in bromelain is responsible for its therapeutic properties, not just one factor that could be isolated. Taking bromelain with a meal, especially the one containing protein, increases the effectiveness of the digestion process. It is important, because undigested protein not only causes gastric problems, but is also responsible for food allergies and intensification of the symptoms of autoimmune diseases. It is commonly believed that the majority of orally administered enzymes get destroyed in the acidic stomach environment. It doesn’t concern bromelain, which preserves its properties in the wide pH scope and its effect is not limited only to stomach, but is extended also to the bowels. Bromelain may take over the functions of pepsin (basic component of stomach juice, responsible for proper digestion) and trypsin (pancreas enzyme engaged in protein breakdown) in the situations of deficits in the organism. Bromelain similarly to other systemic enzymes modulates the work of the immune system. It is responsible for the production of cytokines, especially from the group of interleukins. Immunological response is to a large extent dependent on them. Bromelain weakens biofilm produced by disease-causing microorganisms for the protection against the operation of other factors, which could destroy them. Damaging biofilm causes that they may be easily absorbed by specialized cells of the immune system, called macrophages. Bromelain demonstrates strong anti-inflammatory properties. It regulates the secretion of pro-inflammatory and anti-inflammatory prostaglandins, thanks to which it prevents the inflammation from spreading and reduces swelling and pain that it is often accompanied with. It is very useful in the treatment of injuries in the area of soft tissues, such as muscle or joint pulls. Bromelain has anti-aggregation effect. It prevents pathological clotting of platelets, which leads to the creation of dangerous clots. Moreover, it limits excessive adhesiveness of platelets to endothelium cells which pads out the arteries. It also demonstrates fibrinolytic activity – it stimulates fibrinolysis processes, leading to the clot breakdown. It prevents thrombosis and artery narrowing as well as lowers the risk of coronary disease. Bromelain has antibiotic effect. It is effective especially in the fight with infections in the area of upper respiratory tract – sinusitis, bronchial tubes. Thanks to limiting the thickness of mucus, it may be used in the case of asthma. Bromelain may be used with antibiotics – it facilitates the assimilation of penicillin and amoxicillin. Summing up, Bromelain is a supplement with a wide range of applications. It is recommended especially to people following high-protein diets and sportsmen who, because of their higher needs for proteins, eat higher than standard amounts of protein. An additional benefit from the supplementation is the support of regeneration processes after possible injuries. Bromelain is an enzyme and although it is associated with the work of the digestive system, the spectrum of its pro-health influence on the organism is decidedly much wider. As a means supporting digestion, bromelain should be taken with a meal, preferably rich in protein. 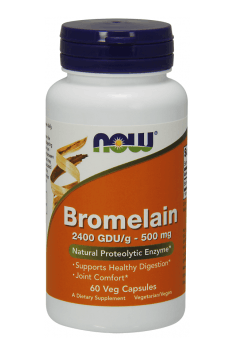 To support the immune system and with the aim of accelerating regeneration after injuries, bromelain may be used between meals. There is a common opinion that using bromelain changes the taste of male sperm. Although it hasn’t been confirmed by science, we may be tempted to empirically try this theory out. A complex of vitamins, amino acids, digestive enzymes, fatty acids and compounds increasing an efficiency. Cranberry concentrate with vitamin C. Helps to fight urinary infections.